Most of the time, the features in the Performance Times Blog concern racing or engine building or something pretty exciting like that. It’s usually something that takes us away from the day-to-day routine. This time, we’re making an exception, because although it has nothing to do with making more horsepower, the subject of this blog is really important to the same independent motorcycle shops that do the majority of the performance work on v-twin motorcycles. Although the economy has started to pick up, some folks may still be a little hesitant to invest in performance upgrades, but they still want to ride! As a result, the independent shops are finding that routine maintenance and repair are becoming an important share of their business. To do that kind of work they need access to quality service parts. That’s why S&S Cycle is extremely pleased to launch a selection of high quality service parts for Harley-Davidson® and other American v-twin motorcycles; Viola V-Twin™! Based on customer demand, we are expanding our product offering to include service/repair parts for stock v-twin engines. Viola V-Twin service parts are available through all S&S dealers. How does Viola V-Twin (VVT) help you if you are not an S&S Dealer? There are a number of ways VVT benefits end users, whether you have your local shop work on your bike or if you are a do-it-yourselfer. If your local shop works on your bike, it means that your engine will be serviced with the finest parts available. VVT parts meet or exceed OEM specifications, and if at all possible, they are U.S. made. If you work on your own ride, you benefit because your local S&S dealer will be able to provide you with top quality service parts, which are as good or better than the originals. Of course if you’re a vintage buff, VVT is a great source of engine parts for your antique v-twin. The Viola V-Twin website at www.violavtwin.com is not only a great place to look for replacement engine parts, but the line drawings and parts listings in the online catalog make it an excellent informational resource. 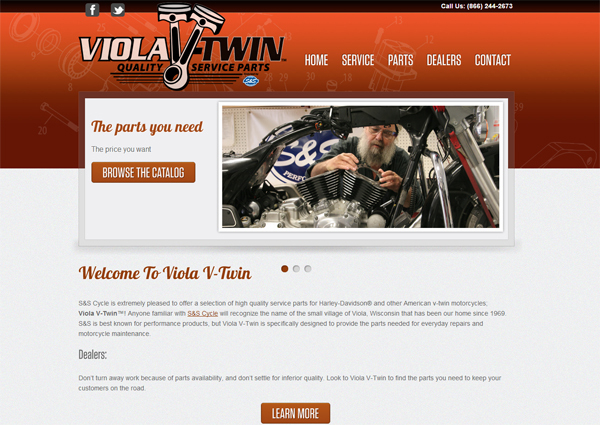 If you don’t have a service manual for your engine, the Viola V-Twin website and catalog are invaluable. You can look at the exploded views to see how your engine goes together, or maybe you just need to find an OEM part number. Browse or search the catalog online or download it in convenient PDF format. We don’t sell online, but there’s a dealer locator to help you find a local S&S dealer who will sell the parts to you and maybe provide some good advice, as well. If VVT doesn’t happen to have the part you need, you can even suggest that we add it to our product line. Just click on the Parts Suggestion Form under the “Contact” menu. Talk to your local S&S dealer or visit us on the web at www.violavtwin.com to learn more about Viola V-Twin service parts for American v-twin motorcycle engines.